Patients say electro-acupuncture feels like a gentle tapping of the skin, according to Dr. Mao. 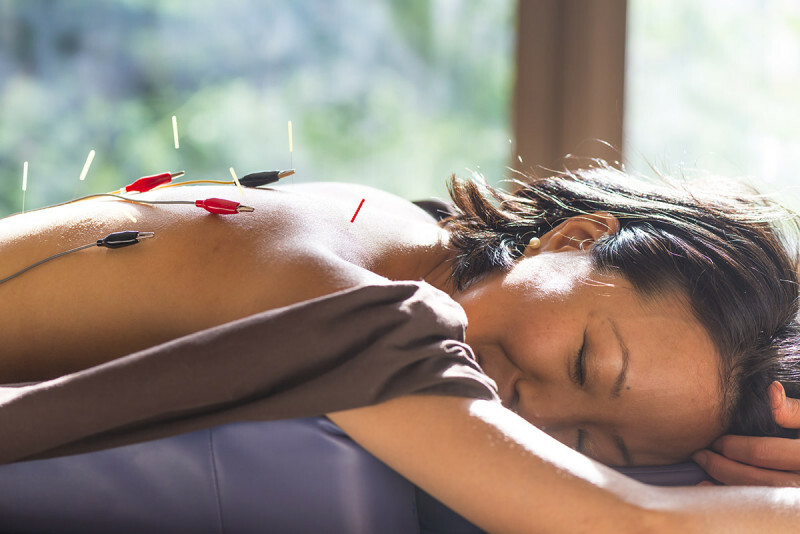 Acupuncture may be an effective way for women with breast cancer to manage hot flashes, which can in turn improve their sleep. Memorial Sloan Kettering’s Chief of Integrative Medicine, Jun Mao, explains why. Women undergoing treatment for breast cancer often experience sleep disturbances related to their hot flashes. Electro-acupuncture, which is offered at Memorial Sloan Kettering, may help improve sleep and reduce hot flashes. Acupuncture does not come with the side effects of common medications for hot flashes, like weight gain. For women with breast cancer, hot flashes — sudden, short surges in body temperature — can be an unpleasant side effect of treatment. But new research from Jun Mao, MSK’s Chief of Integrative Medicine, may point toward a source of relief. He found that electro-acupuncture, a type of acupuncture that uses tiny needles gently activated by a current, could help reduce this symptom. We asked Dr. Mao to elaborate on his stimulating new study, which was published in the journal Menopause. Why do women with breast cancer often experience hot flashes? Hot flashes are a very common side effect for women with breast cancer. They can be induced by premature menopause due to either the surgical removal of the ovaries or chemotherapy. Also, many cancer drugs that affect the hormones, like tamoxifen or aromatase inhibitors, can make hot flashes worse and more persistent. The existing drug approaches for treating hot flashes are partially effective, but not for all patients, and some of them have quite bothersome side effects like weight gain and sexual side effects. I think patients need more options. What did your study look at? We know that hot flashes can result in a lot of sleep disruption. People’s sleep is very fragmented and they feel very tired. It’s like a snowball effect. So we compared electro-acupuncture, an integrative medicine technique, with gabapentin, a drug that has been shown to be effective for hot flashes in people with breast cancer. I was thinking, at best, that acupuncture could be as effective as gabapentin, so it was a pleasant surprise to show that it may be even a little better. We found that electro-acupuncture actually produced a better overall sleep quality than gabapentin, and also produced better results in specific areas such as sleep latency — the time it takes to fall asleep — as well as sleep efficiency, meaning how much of the time in bed you’re actually sleeping. These data are very encouraging and offer the potential that women with breast cancer may have another tool to help them manage hot flashes, as well as sleep as related to hot flashes. How is electro-acupuncture different from regular acupuncture? Would regular acupuncture have the same effect? Our study can only demonstrate that electro-acupuncture, a type of acupuncture we offer at MSK, is helpful. The way it works is not just by putting needles in the skin — some of the needles are paired with electrodes to stimulate a current. Those currents provide very gentle stimulation; often patients say it feels like a gentle tapping of their skin. How did you come up with the idea to study this? Basic science in animals has shown that electro-acupuncture can make the brain release endorphins as well as influence a type of neurotransmitter called norepinephrine. Those types of neurotransmitters, which transmit signals from one neuron to another in the brain, have also been implicated in temperature regulation. I’d seen some studies demonstrating that acupuncture may be effective in reducing hot flashes, but often the number of people in the study was very small and the design was kind of problematic. So I set out to design my own study. When I wrote the trial, there was a study showing that in a large sample of breast cancer survivors, gabapentin was effective for hot flashes, so that’s why I picked it as an effective comparator. Before you began your research, did you have any guesses about what the results might be? What would you tell a patient who wanted to try acupuncture for hot flashes? I would say it’s something worth trying. A course of acupuncture treatment — six to ten sessions — may stabilize the body’s ability to regulate its temperature. Ideally, someone could come twice a week, but once a week would probably be OK too. How can these findings be taken from the lab to the bedside? The next step is to do a large trial with a long-term follow-up to understand the effects of acupuncture versus the effects of conventional therapies, like drugs for hot flashes, sleep, and fatigue. We want to examine the long-term durability of those therapeutic effects because I think a lot of women want to know if it will work for them and if the effect lasts. Those are all really important, patient-centered questions that require research. I am a 41 year-old breast BRCA-2 mutated breast cancer survivor of three years. I will be undergoing a salpingo-oophorectomy next month and I am incredibly concerned about the immediate onslaught of menopausal symptoms, namely hot flashes. Is this treatment available in Commack? Dear Kristine, we do plan to offer acupuncture to our patients at MSK Commack in the coming months. In the meantime, you may call our Integrative Medicine Service, which maintains a list of cancer-trained acupuncturists by location. You may call 646-888-0800 to find someone in your area. We wish you well as you prepare for your upcoming surgery. Thank you for reaching out to us. I have used regular acupuncture (once a month) for hot flashes for several years and it works. After my cancer treatment, I also had a complete hysterectomy and the hot flashes were unbearable. I have the occasional hot flash but it is less intense. Hi Susan, we’re happy to hear that you’ve benefited from acupuncture. Thank you for sharing your story. Can you provide the source research? You don't mention the blinding procedure or the number of individuals in the study. What is the prior plausibility that acupuncture stabilizes body temperature? What well-done study really demonstrates that acupuncture releases endorphins? While you are at it can you provide one well-done study proving acupuncture is anything other than placebo? Hi Otis, you can find a link to the full study here: https://www.ncbi.nlm.nih.gov/pubmed/27875389 Thank you for your comment. I'm a 69 year old male prostate cancer patient of Dr. Zelefsky dealing with the effects of androgen deprivation therapy, especially sleep deprivation due to hot flashes. I'd be very interested in your treatment, especially if available in MSKCC West Harrison location. Any experience with male subjects? A nice November 13, 2017 MSKCC facebook entry about my NYC Marathon participation. Dear Michael, do provide acupuncture at our MSK Westchester facility in West Harrison. Appointments are available, every Wednesday with Matthew Weitzman, one of the licensed acupuncturists on staff at MSK’s Integrative Medicine Service. For more information about whether acupuncture is right for you - and to make an appointment - please call our Integrative Medicine Service at 646-888-0800. Thank you for reaching out to us. Is this treatment available at the Monmouth location? Is this something that needs constant treatment or will the 6-10 sessions be enough? Dear Jackie, MSK’s Integrative Medicine Service is working bring acupuncture to our patients at MSK Monmouth by the end of this year, 2017. In the meantime, you may be interested to know that we do offer acupuncture at our outpatient center in Basking Ridge, NJ: https://www.mskcc.org/locations/mskcc-basking-ridge. If it’s not convenient for you to make an appointment for acupuncture there, you can try calling our Integrative Medicine Service at 646-888-0820 for a community referral closer to you. Also, you may consider signing up for our About Herbs newsletter, which is a good way to learn about new service locations and other programs related to Integrative Medicine: https://www.mskcc.org/subscribe?herbs=1&back=/cancer-care/treatments/sy…. For acupuncture it is a very powerful therapy. I have been treating lots of Senior with Diabetic Peripheral Neuropathy , Peripheral Neuropathy, Chronic, and as well asIdiopathic Pain. I am helping my patients one patient at a time.